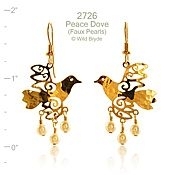 Our beautiful Flying Peace Dove Earrings feature delicate white faux pearls. Perfect for the Holiday season, or for any time! Featured here in 14k gold-plate with 14k gold-fill earwires, this style is also available in a rhodium (silver) finish with sterling silver earwires.